Pregnancy management in phenylketonuric women includes continuous dietary control starting before conception, aiming to maintain blood phenylalanine concentrations in a desirable range, irrespective of the fetal genetic PKU status. 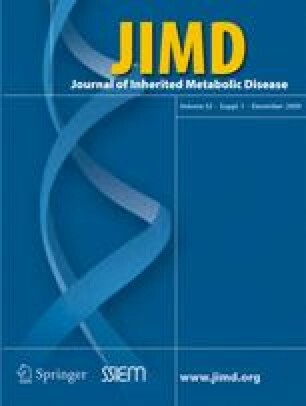 While the maternal phenylalanine hydroxylase (PAH) genotype will influence metabolic control, an effect of the fetal genetic PKU status on maternal metabolic control during pregnancy has not been described. We monitored three pregnancies of women with classical PKU by dietary protocols of daily phenylalanine intake, phenylalanine blood concentrations, and obstetric care. Patients 1 and 2 carried a heterozygous (not PKU-affected) fetus, while patient 3 was pregnant with a PKU-affected fetus (PAH p.R408W and p.R408W). The expected increase in phenylalanine tolerance during the course of pregnancy was observed in patients 1 and 2 in whom phenylalanine intake could be steadily increased from 400 to 1700 mg/day while phenylalanine blood concentrations remained in the desired range. Gain of body weight was 13.0 and 17.7 kg, respectively. In patient 3, the phenylalanine tolerance did not rise above 600 mg/day, and phenylalanine blood concentrations were above the desired range on several occasions. Caloric intake was therefore encouraged, which led to a weight gain of 20.0 kg. The course of pregnancy was otherwise normal in all three cases, and infants with normal birth weight and head circumference were born. The different phenylalanine tolerance in pregnancies with PKU-affected and non-affected fetuses suggests that PAH genotype and metabolic situation of the fetus influence maternal metabolic control. A phenylalanine tolerance remaining low in the third trimester of pregnancy may indicate fetal PKU. References to electronic databases: Phenylketonuria: OMIM 261600.